Welcome back to our awesome interview series, ESL Around the World. If you’ve been thinking about teaching English abroad, this interview series was made just for you. Every interview is about a specific place, meant to give you all the information you could possibly need to know. We’ve already interviewed people who taught in Oman, Cambodia, and Kazakhstan. Today we’re going to find out what it’s like teaching English in Thailand. Stay tuned for the next interview in our ESL Around the World series! Matt and Marilyn are a couple from New York in the United States. They’ve lived in and visited various countries together, teaching English as their way of income. They’ve taught English in Thailand, South Korea, and Vietnam. After just a few weeks in Vietnam, they moved on to teaching English on the computer. Currently, they live in the Czech Republic, still teaching online. They run the awesome podcast Words With Winos where they pick a topic and talk about it openly and honestly while they drink a bottle of vino. Throughout the episode, they provide tons of travel tips, experiences, and banter! They can’t finish the episode until the bottle is finished, no matter how long it takes them. They were kind enough to interview us on the show a few months ago. Naturally, we drank a bottle with them! At the time, they were in Prague and we were in Mexico so it was kind of funny polishing off a bottle of wine in the middle of the afternoon but it was fun (one of the perks of working online)! Marilyn & Matt are always on the go doing cool stuff so be sure and keep up with their travels on Instagram and Twitter. Now, on with the interview! Where did you teach and what was your position? We taught in Chonburi, Thailand, which is about an hour and a half drive southeast from Bangkok. We were both ESL teachers. Matt taught second-grade students and I (Marilyn) taught fourth-grade students. We taught from the beginning of November 2014 to the end of March 2015. What were the necessary qualifications to teach in Thailand? For our job in our private elementary school, we needed Bachelors Degrees. That was it! What were the hours and pay like? We were paid just about $900 per month. Although that may seem low, it worked perfectly for Thailand! We were paid more than a lot of the Thai teachers there. We were in school from 8AM to 4PM Monday through Friday, but we only taught between one and three 40 minute class per day! The rest of the time, we were able to sit at our desks and relax. What was a typical day like? We’d arrive at the school at 7:30 AM for the first class. We also had the option to have a free breakfast at the school a little before then, so sometimes we’d go to school earlier for that. Throughout the week, we taught some of the typical subjects, in English (of course): English class, Science, Math, P.E., and Reading. However, we’d only teach 1-3 classes per day. We’d teach English once every day, P.E. twice per week, and Science, Math, and Reading once per week. Since we only taught 1-3 classes per day, we had a lot of downtime! We spent a lot of our time playing on our computers or phones, reading, or grading homework/tests. We also got an hour lunch break in the middle of the day, where we had two options: either eat the somewhat nasty food at the school or spend a dollar on an amazing lunch at the restaurant on the corner. Most of the time, we chose the latter. After the last class of the day, we went back to our apartment. What were the pros and cons of your job? PROS: We had lots of time to relax, as I mentioned. We also had the freedom to teach what we wanted and how we wanted, which was fantastic. Our apartment was only a 10-minute walk from the school. The agency we went through helped us get our work visas and helped us with anything we needed. Each semester was only about four months long and we had a good amount of random holidays. We had the weekends off to explore and relax. We also had other foreign teachers in our school to spend time with, bounce ideas off of, etc. We learned a lot about Thai culture. I can still count to 30 in Thai and we left the country in April 2015! The students were all super cute and curious about our lives. I still talk to a couple of them via social networking to this day! CONS: The pay was quite low compared to other places, like South Korea and China, for example. We were in control of 30 students each and they often acted up because they didn’t listen to us. The students in Thailand often don’t take English teachers seriously as they know we are generally more relaxed in temperament. So, they would often take advantage of that. It was hard to control them. The Thai teachers weren’t fans of us because we made more money than they did, so they never really helped us when we needed it. There wasn’t WiFi in half of the school, which happened to be where Matt worked, so he had nothing to do during our many hours of downtime. What’s the best way to find a teaching job in Thailand? We would recommend using Dave’s ESL Cafe. It’s an enormous job board of schools/agencies looking for ESL teachers around the world. For our job in Thailand, we found it last minute on Craigslist. But, it worked out for us, so if you happen to be desperate like we were, try there! You can even just Google “ESL jobs in Thailand” and lots of opportunities will pop up! Why did you choose to live and teach in Thailand? What did you like and dislike about it? After college, the both of us wanted to travel the world. We were young and broke, but wanted to go to a place that was completely different from anything we’d ever known. That, and we needed a place that was affordable. Thailand hit everything we wanted, even with a bonus of fantastic weather! We liked so much about teaching in Thailand! We loved Thai weather, food, nature, and culture. It was an extraordinary place! We really did enjoy our students, the entire task of teaching the English language, living and working in a new country, and just overall doing something different and exciting with our lives. We didn’t particularly enjoy the job very much. Even though it may have sounded easy, it was still a job and, therefore, often aggravating. The pay was quite low, as I mentioned earlier. We were also bummed that our apartment didn’t have a kitchen or any appliances, so we had to eat out for all of our meals (then again, Thai food is so delicious and cheap, so maybe that wasn’t exactly a negative!). What was the cost of living like compared to your earnings? Were you able to save money? The cost of living is extremely low in Thailand. Even though we only made $900 per month, we made it by comfortably. Our rent was about $70 each per month (we lived in a small, hotel-style room) and a good meal cost about $1-3 each. Traveling, in general, was also dirt cheap! So, we were able to save a good chunk of our earnings! Had you taught in another city or country before? Before going to Thailand, no. We were fresh out of college then. However, a few months after Thailand, we did teach in South Korea. The jobs we had were so drastically different from one another! In Korea, we were paid about $1,700 each, our room was free, we had much smaller classroom sizes (3-10 students! ), our airfare was paid for, and we only taught English, not other subjects. In that regard, that job had our job in Thailand beat. However, our boss in Korea made the job impossible to enjoy or even tolerate. She was very demanding and rude and she expected the world from us. We often worked 1PM-9PM with no breaks. It was exhausting. In Thailand, it was far more laid back and our bosses were never “on us” about most things. We actually enjoyed our bosses in Thailand! What advice do you have for people considering moving abroad to teach English? Our advice is to do your research if you’re serious about teaching English abroad. You can teach in many different kinds of schools or learning centers based on your experience/background. You could work in public schools, private schools, international schools, and even universities! There are tons and tons of options out there for just about anyone! Make sure to do your research is our main advice, but also make sure that when you find a job or jobs, ask a lot of questions! It will make you feel better about your decision in the long run. That, and research the school/learning center you’re leaning towards. Then, when it all sounds good (or, at least decent), then just do it! Start on the paperwork, get all of your visa nonsense done, book that flight, and go! It was the single greatest decision either of us has ever made – pros, cons, and all. There you have it! Sounds like teaching English in Thailand is a pretty laid back experience! It definitely just got bumped to the top of my list of places to live when I get tired of doing the digital nomad thing. Southeast Asia is still my favorite part of the world (that I’ve been to). 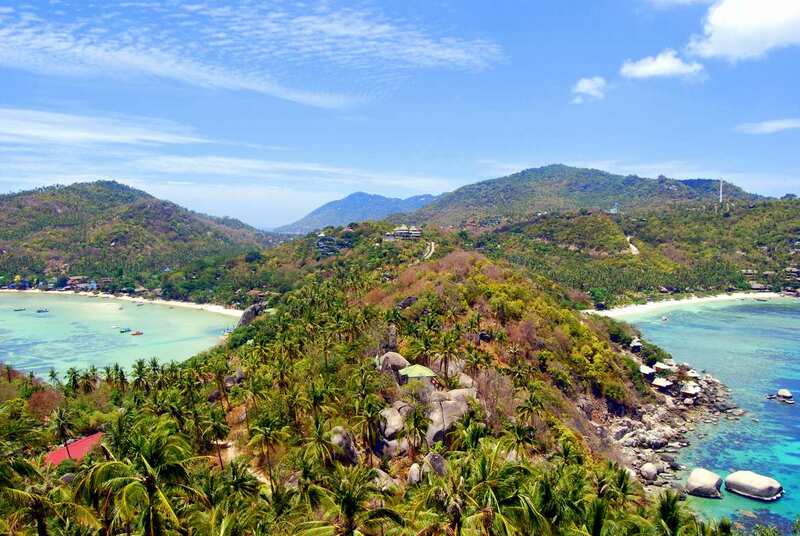 Teaching English in Thailand is a great idea not only because it’s so laid back, but because there are so many amazing places to travel to during your holiday time. If you ever need any info about traveling in Thailand, we’ve got posts on how to spend 3 days in Bangkok, a guide to the Full Moon party on Ko Phangan, how to ride the Mae Hong Son Loop, things to do in the hippie mecca of Thailand, and Chiang Mai. Although you don’t need one for the teaching job that Matt and Marilyn had, it’s still a good idea to get a TEFL certificate. Not only will it help you find a job, but it will also teach you classroom management, how to plan a lesson, be entertaining while teaching, and help you teach with confidence. Read more about getting an English teaching certificate here. We got our TEFL certificates with BridgeTEFL and would highly recommend them. They provide a stellar course and will pair you with an online mentor to grade your assignments and help you as you progress. Click here to learn more about BridgeTEFL and the costs of their courses. This post may contain affiliate links. If you purchase something through our link we will earn a commission at no extra cost to you! The earnings go towards running this site. Thank you for the support! We only recommend products we have personally used and trust.